Today, i'm gonna show you how to get started with OWIN and Katana Project. Open Web Interface for .NET (OWIN) is a specification for the interaction between web servers and web applications. It has its roots in the open source community. By decoupling the web server from the application, OWIN makes it easier to create middleware for .NET web development. Also, OWIN makes it easier to port web applications to other hosts, for example, self-hosting in a Windows service or other process. OWIN is a community-owned specification, not an implementation. The implementation of OWIN is called as Katana Project. The Katana project is a set of open-source OWIN components developed by Microsoft. Deployment is easy because it involves only a single application rather than one application per capability. You can add additional capabilities, such as authentication, which can apply to all of the downstream components in the pipeline. Different components, whether Microsoft or third-­party, can operate on the same request state via the environment dictionary. So, Katana is a flexible set of components for building and hosting OWIN-based web applications. And this post is just a quick start to give you an impression of the power that Katana gives you. The code below shows how easy is to get started with Katana. Create a new console application and install the nuget package: Microsoft.Owin.SelfHost. And If you now paste the code, you will already have a working website at localhost:8080. We define a url and a startup class. The Startup class needs a configuration method in which we can set the run method with a Func on your IAppBuilder. This appbuilder is the “configuration” of your web application and the run method adds a piece of middleware to your OWIN pipeline which doesn’t invoke a next piece of middleware. Look at it at as the endpoint of all the web requests for this small web application. The appbuilder also allows you to add more middleware to your OWIN pipeline. If we for instance want to have some middleware that handles cookies we can add it with a few lines of code. And now, we need to inherit from OwinMiddleware, add a constructor and a async Invoke method. In the invoke method we add our cookie (or whatever logic you want) and make it invoke the next middleware down the pipeline. To plug this middleware into our application, we only need our appbuilder to use it. Just add the following line in your Startup class above the app.Run line and your done!! Now, you have a working Katana Web Application that adds an annoying cookie. Easy right? This was a really simplified example and there is a lot more to Katana. 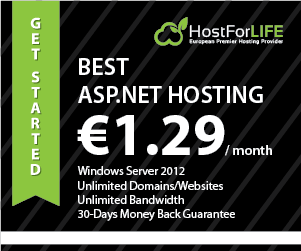 For the best OWIN and Katana.NET Hosting, HostForLIFE.eu is the right answer! SQL Server 2014 Hosting Russia - HostForLIFE.eu :: How to Rename Column Name in SQL Server ? In this post, I will tell you about rename column name in In SQL Server. Now, I’ve got a table “tblRename” in which there are the two columns Id and Name. But by mistake I misspelled Name to “Names” and now I want to change the column name to the correct name -> “Name”. So, how is it possible to rename the column name without dropping the table? We can use a System Stored Procedure sp_rename. sp_rename is the Stored Procedure.The first value is the tblRename that is the table in which the column is to be renamed, as in "Names" -> tblRename.Names. The second value is the new segment name that we need to change it to, in other words Name. The third value is the sort and here the sort is segment. Along these lines, if there are any Stored Procedures and scripts indicating this tblRename table in which you have determined the "Names" segment then that Stored Procedure or script won't come being used any longer in light of the fact that now there is no section present with a name "Names". In this way, in the event that you need to change the segment name then do it before making any important Stored Procedures or scripts. Here's a convenient script that is a piece of my tool stash all over I go. Scripts out and identifies basic database level security objects, and creates a TSQL proclamation to reproduce the items. 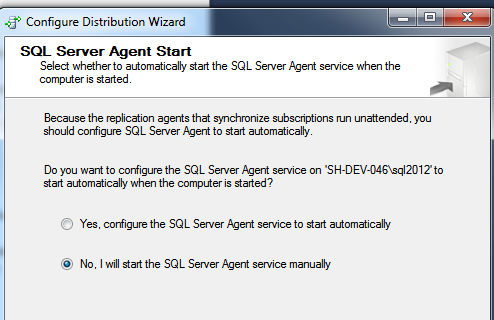 Note that this script just chips away at SQL 2005 or above. This is a long way from an authority script. I invite to all input on these scripts. I likewise have a server-level security script here. --Run the below on each database for database-level security. Node.js Hosting Germany - HostForLIFE.eu :: How to Create Server Using Express.js in Node.js ? This time we will follow a complete and a smart way to create a HTTP server that is exact and quick in Node.js. Express is insignificant and adaptable Node.JS web application framework that gives a vigorous set of gimmicks of web and portable application. What's more, it will help you in making APIs that verifiably take a shot at the HTTP protocol. Note: express is the package name. After Installing, you will get a folder node_modules that consists of all the modules that you install from npm. SQL Server 2014 Hosting Germany - HostForLIFE.eu :: How to Use a Filtered Index to Enforce Filtered Uniqueness in SQL Server ? One of the benefits and uses of Filtered Indexes in SQL Server is to produce filtered uniqueness. clearly this has some implications, thus please perceive what you are making an attempt to accomplish. In the below example, we've a compound natural key of the 2 fields key1 and key2. the field bit1 isn't a member of the natural key, however will inform us as to some table usage. maybe bit1 indicates that this record is Active (1) or Inactive (0), or whether or not the info is Confirmed (1) or unconfirmed (0), or Deleted (0) or Not Deleted (1). We do not care whether or not there are duplicate records for once bit1 = 0. In this means, you'll "deactivate" (in business terms) a record by setting bit1 = 0, while not violating your natural key's uniqueness on (key1, key2). create unique nonclustered index idx_nc_u_f_tabletestdups_key1_key2_bit1 on dbo.tabletestdups (key1, key2, bit1) WHERE bit1 = 1 --Note the important WHERE clause here at the end of the index. 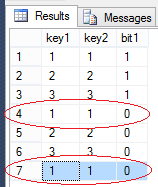 insert into dbo.tabletestdups (key1, key2, bit1) values (1,1,0) --succeeds because the unique constraint only enforces bit1 = 1. Note that rows four and seven have allowed duplicate combination of key1 =1, key2= 1 and bit1 = 0, but that previous attempts to insert a duplicate combination of key1 =1, key2= 1 and bit1 = 1 unsuccessful.